We love pasta and we love seafood. So seafood pasta is a natural dish for us. This version of sauteed scallop pasta uses ramen pasta noodles in a pan sauce to quickly achieve a wonderful flavor in a very simple dish. 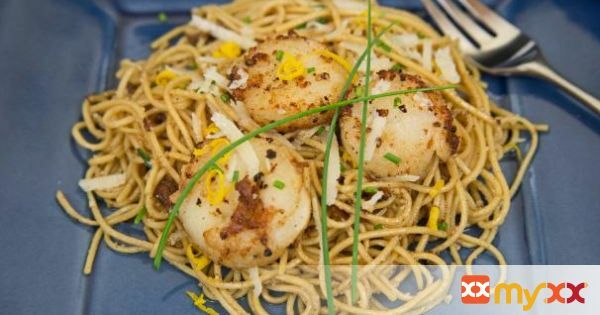 For a flavorful quick meal here's the recipe: ***Check our blog for directions on how to cook scallops properly. 1. 1. After patting the room temperature scallops dry, salt, pepper and apply granulated garlic to both sides. 2. 2. Start the ramen noodles boiling. When boiled for 4 minutes, drain, rinse and shake dry. Reserve until needed. 3. 3. Heat the oil to medium-high heat in a 12 inch non-stick saute pan. When hot, place the scallops in the pan and cook for three minutes on one side. Carefully turn them and cook for another three minutes then remove and reserve in a warming oven with the plates until serving. 4. 4. Reduce the pan heat to medium and place the minced garlic in the pan. Cook for about 1 to 1 ½ minutes. 5. 5. Carefully pour in the wine and deglaze the pan, stirring up all of the little brown bits of scallop. Add the butter and stir to create the pan sauce. 6. 6. Add back the pasta, chopped chives and grated Parmesan cheese and mix thoroughly.